(Francisco Kjolseth | The Salt Lake Tribune) Utah lawmakers on Monday unanimously passed a resolution honoring the Navajo Code Talkers and dedicating Aug. 14, 2019, to the World War II service members whose unbreakable code boosted the U.S. Marine Corps in the Pacific Theater. (Francisco Kjolseth | The Salt Lake Tribune) Navajo Nation President Jonathan Nez, shakes hands with state senators after Utah lawmakers on Monday unanimously passed a resolution honoring the Navajo code talkers and dedicating Aug. 14, 2019, to the World War II service members whose unbreakable code boosted the U.S. Marine Corps in the Pacific Theater. 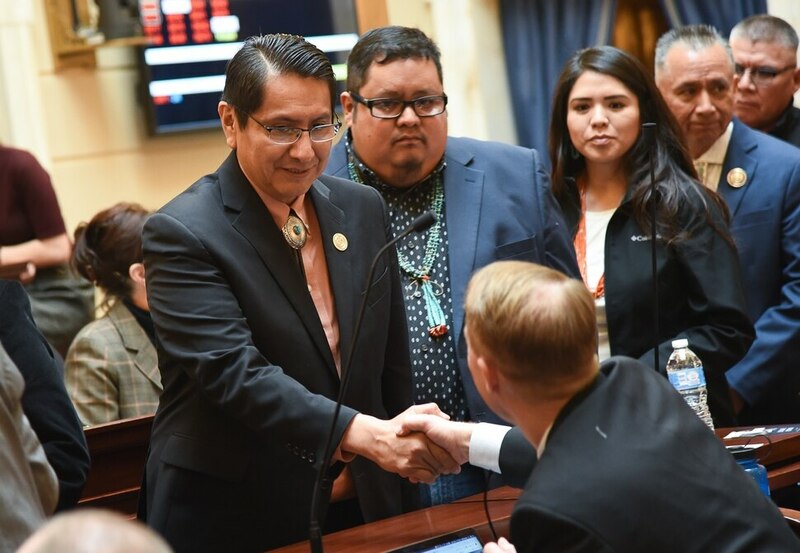 (Francisco Kjolseth | The Salt Lake Tribune) Members of the Navajo nation take to the Senate floor as Utah lawmakers on Monday unanimously passed a resolution honoring the Navajo Code Talkers and dedicating Aug. 14, 2019, to the World War II service members whose unbreakable code boosted the U.S. Marine Corps in the Pacific Theater. (Francisco Kjolseth | The Salt Lake Tribune) Gregory Hurley helps hold historic photographs on the Senate floor of Navajo Code Talkers being recognized at the Utah Capitol on Monday, Feb. 4, 2019. (Francisco Kjolseth | The Salt Lake Tribune) Utah lawmakers on Monday unanimously passed a resolution honoring the Navajo Code Talkers and dedicating Aug. 14, 2019, to the World War II service members whose unbreakable code boosted the U.S. Marine Corps in the Pacific Theater. (Francisco Kjolseth | The Salt Lake Tribune) Seth Damon, Jonathan Nez, Nathaniel Brown and Shirlee Silversmith, from left, stand in the House floor as the Utah lawmakers on Monday unanimously passed a resolution honoring the Navajo Code Talkers and dedicating Aug. 14, 2019, to the World War II service members whose unbreakable code boosted the U.S. Marine Corps in the Pacific Theater. (Francisco Kjolseth | The Salt Lake Tribune) Holding historic photographs of Navajo Code Talkers, Nizhoni Fielding, center, and Andrew Yazzie join Utah lawmakers on Monday as they unanimously passed a resolution honoring the Navajo code talkers and dedicating Aug. 14, 2019, to the World War II service members whose unbreakable code boosted the U.S. Marine Corps in the Pacific Theater. Utah lawmakers have set aside a day in August to honor the Navajo Code Talkers, a group of World War II service members who used their tribal language to confound enemy combatants in the Pacific theater. A delegation from the Navajo Nation, including President Jonathan Nez, stood on the floor of both chambers as the votes took place, alongside blown-up photos of the Code Talkers. “The Navajo Code Talkers leave a legacy of service that continues to inspire others to achieve excellence and instill values of pride, discipline and honor,” said Rep. Christine Watkins, R-Price, the House sponsor of the resolution. Nez praised the legislation for raising awareness about Navajos' contributions to the U.S. effort in World War II. The unbreakable code developed by the Navajo service members was used to transmit messages for the U.S. Marine Corps from 1942 to 1945. Eight of the original 400 Code Talkers are still living: Fleming Begaye, Thomas H. Begay, William Brown, John Kinsel, Peter MacDonald Sr., John Pinto, Samuel Sandoval and Joe Vandever. “We as a nation owe such a debt of gratitude to the Navajo Code Talkers. They changed the course of World War II,” Rep. Phil Lyman, R-Blanding, said ahead of Monday’s House vote. A Utah Senate news release stated that more than a dozen Code Talkers were killed in action, with about a dozen more wounded. The Navajo code was declassified in 1968, and in 2001, then-President George W. Bush and Congress awarded the Code Talkers Congressional Medals. Reporter Brian Maffly contributed to this report.